[Update 4/19] Reinhart Lab has a new paper out that is going to attract a lot of attention. Using HD-tACS, they were able to improve Working Memory in older adults (compared to younger adults). This article nicely summarizes the experiment: Brainwave Synchronization Reverses Age-related Decline in Working Memory …HD-tACS boosted interactions between theta & gamma rhythms in left temporal cortex & synchronization of theta brainwaves between left temporal cortex and prefrontal cortex. Paper: Working memory revived in older adults by synchronizing rhythmic brain circuits. You may have noticed that I’ve not been posting as much to the blog lately. The blog is already so full of useful content for anyone looking into tDCS that I’m inclined to only post significant information that would move our current understanding of tDCS and neurostimulation forward. This article/paper describing a new technique using ‘HD tACS’ to synchronize (brainwaves) parts of the brain definitely looks intriguing and has implications for anyone paying attention to DIY neurostimulation. Very early, but very interesting. “These (medial frontal cortex & lateral prefrontal cortex) are maybe the two most fundamental brain areas involved with executive function and self-control,” says Reinhart, who used a new technique called high-definition transcranial alternating current stimulation (HD-tACS) to stimulate these two regions with electrodes placed on a participant’s scalp. Using this new technology, he found that improving the synchronization of brain waves, or oscillations, between these two regions enhanced their communication with each other, allowing participants to perform better on laboratory tasks related to learning and self-control. Conversely, de-synchronizing or disrupting the timing of the brain waves in these regions impaired participants’ ability to learn and control their behavior, an effect that Reinhart could quickly fix by changing how he delivered the electrical stimulation. 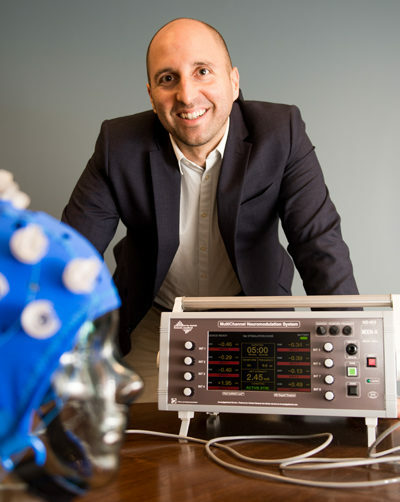 The work, published October 9, 2017, in the journal Proceedings of the National Academy of Sciences (PNAS), suggests that electrical stimulation can quickly—and reversibly—increase or decrease executive function in healthy people and change their behavior. Here’s the paper (paywall): Disruption and rescue of interareal theta phase coupling and adaptive behavior. The supplemental pdf. describes the equipment used in the experiment. High definition transcranial alternating current stimulation ( HD- tACS ). The alternating current stimulation was administered noninvasively using an MxN9-3 channel high definition transcranial electrical current stimulator from Soterix Medical (New York, NY). Eight sintered Ag/AgCl electrodes were attached to high-definition plastic holders, filled with conductive gel, and embedded in the Biosemi EEG cap. HD-tACS electrode placement was guided by current-flow modeling using HD- Explore and HD-Targets (Soterix Medical), with the goal of targeting the MFC and lPFC to facilitate the synchronization of neural activity between these regions (the in phase protocol ) or disrupt the signals being conveyed between the MFC and lPFC (the antiphase protocol ). Listen to Bob McDonald discuss HD tACS with Prof Rob Reinhart on the always interesting Quirks and Quarks.